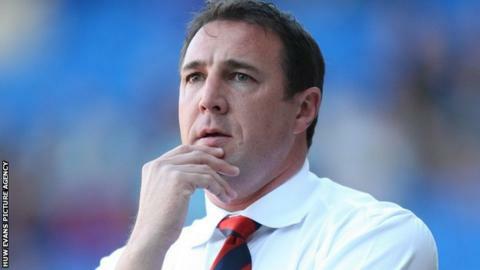 Cardiff City manager Malky Mackay insists his team are keeping their feet on the ground despite going into Tuesday's home clash with Birmingham joint top of the Championship. The Bluebirds have won four of their last five outings and are unbeaten at home this season. But Mackay will not be getting ahead of himself. "There is nothing to get carried away about. We have only played eight league games," he said. "It's far too early in the season and there's far too few games have taken place to have [a] swagger. "That's a 10-games-to-go type thing when teams are on a real roll and look as if they are on their way up." And he warned of the pitfalls of thinking too far ahead in a league where Cardiff have lost in the play-offs the last three years in a row. "It's a league where it's unforgiving and the minute you do decide to focus on anything other than the task in hand [or] the game in front of you it usually comes up and bites you," he warned. But as he prepares to try and win a fourth straight home match, Mackay was full of praise for his team's display in the 3-0 win over Blackpool on Saturday - following earlier home wins against Huddersfield Town, Wolverhampton Wanderers and Leeds United. "I thought it was as complete a performance as we have had, bearing in mind the opposition. I think Blackpool will be definitely there and thereabouts at the end of the season," reflected Mackay. "The way we went about our job on Saturday from the first minute to the last I was so impressed with my boys' performance. It had the stadium rocking as well." Mackay wants to continue to make the Cardiff City Stadium an unwelcome place for visiting teams. "What I want to have is a noise emanating from the stadium, near capacity crowds, [and] a team on the pitch who are attacking their opponents and winning games," he said. "Momentum can build with that, that is when as an opposition player you arrive at a ground knowing that an opposition have that." On the downside Cardiff City are likely to be without Jordon Mutch and Tommy Smith for Birmingham. Midfielder Mutch has missed the last two games with a foot injury and will not return until Saturday's trip to Ipswich. Winger Smith was withdrawn after 25 minutes in that fixture with a muscle problem and is a major doubt.